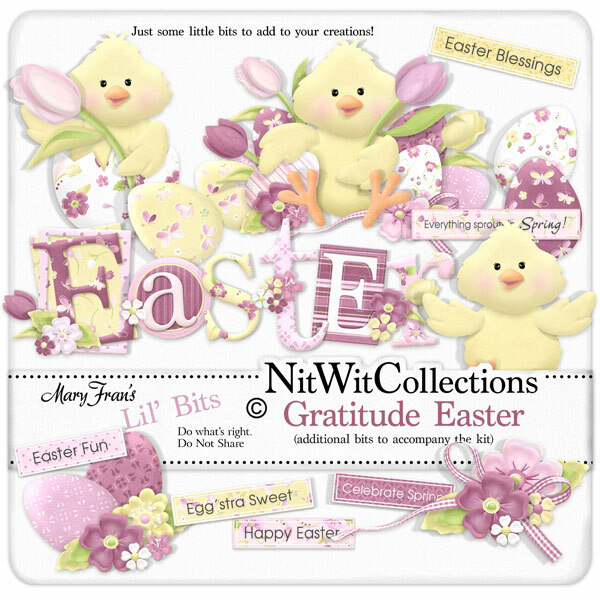 "Gratitude Easter" Lil' Bits are the accompanying co-ordinated elements if you would like to use this Collection for an Easter themed layout or card. Elements in the Lil' Bits are NOT included in the "Gratitude" FQB. 1 Chick - surrounded by flowers and eggs - how much more Easter than that can you get? 1 Egg Cluster - complete with flowers - would make a brooch that people would really "talk" about! 6 Wordstrips with an Easter theme to them....now why did I do that? ?